Students are occupying a university building at 11 Bedford Square in Bloomsbury, central London in protest against the government’s cuts. The building will become an Anti-Cuts Space. A base to unite both students and workers in protest against the coalition government’s cuts. Solidarity. A banner hangs from a window at 11 Bedford Square which is being occupied by students in protest against the government's cuts. Students, lecturers and university staff are occupying a university building at 11 Bedford Square in Bloomsbury, central London in protest against the government’s cuts. Students inside the building said they will occupy the building peacefully. A group of students and staff entered the building on Friday, 25 February with the intention to use it as a base to unite both students and workers in protest against the coalition government’s cuts. The building will become an Anti-Cuts Space. They have hung banners from the windows saying “Solidarity” and “Don’t run with scissors, service cuts don’t heal”. The activists told Fitzrovia News they want to use the building as a base to organise events leading up to the forthcoming national day of action. On Saturday 26 March 2011 thousands of workers and students will take to the streets to tell the government that savage spending cuts are unnecessary and unfair. The march is being called by the TUC in protest against the public service cuts, and will also be supported by charities and community groups including the Fitzrovia Neighbourhood Association. We’ve just occupied a space in Bedford Square, Bloomsbury, a grade-one listed five story building with four big meeting spaces and several smaller seminar rooms. The building belongs to Royal Holloway, and some of us are Royal Holloway students; but we don’t want this to be an occupation organised around demands made on our education institutions. We want the occupied space to be a convergence centre available to all anti-cuts activists in London. The building is now named Anti-Cuts Space London. If you’ve had difficulty finding somewhere to organise and are looking for space, write to us and we’ll see what we can do. If you want to give a talk, facilitate a discussion: write to us! We already have a provisional schedule, and we want to be adding to it all the time. The poorest and most vulnerable in society are being attacked – this is no longer a distant, ominous future. It is happening now. The program of austerity being conducted by this government condemns us all. To defeat it, students must join with the wider anti-cuts movement. We share the same goals and we must share the same spaces. To co-ordinate, organise and build the movement we must come together. Communities, take your spaces. Students, take all spaces. Inspired by the campaigns and actions springing up across the country, we are opening this as a space to link up and share ideas and strategies for how to fight the cuts. We urge others around the country to act now. Resistance is an emergency situation, and the escalation towards the demo on March 26th is our most urgent task. We can never win in isolation, but everything is possible if we recognize our collective strength. Occupy everywhere. Link up. Find each other. Resist. Again Twitter was used to raise awareness of the occupation and asking students for support. 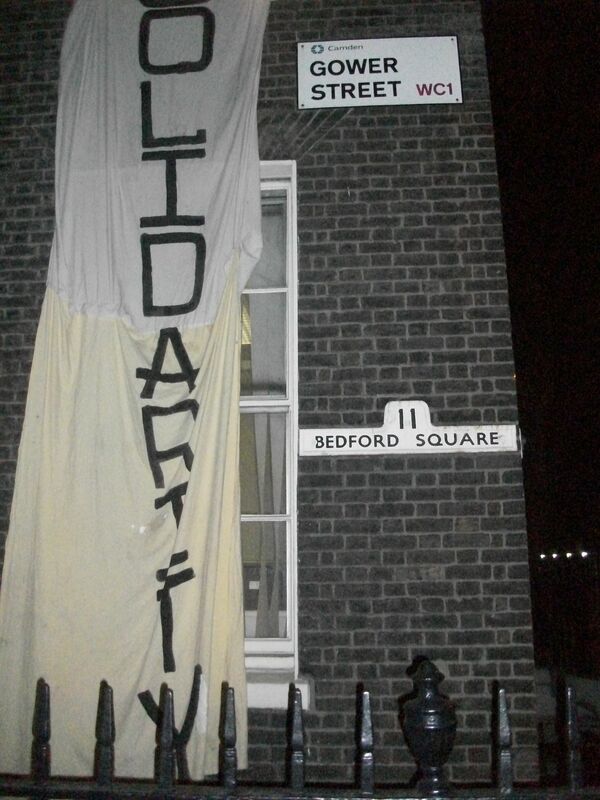 “A new anti-cuts space has been opened in 11 Bedford Square. Big building, mass convergence centre against cuts. Go check it out! #demo2011“, said one of the first tweets announcing the occupation. However, activists stress that social media in itself will not bring about positive change. People need to take action and show their anger against the education and public service cuts. [Students] have hung banners from the windows saying “Solidarity” and “Don’t run with scissors, service cuts don’t heal”. Aren’t those “students” such daring revolutionaries? Did any of those students (they are students, there’s no need for extra punctuation) claim to be daring revolutionaries, or anything more than activists? Fitzrovia News is ever becoming one of the most relevant and radical news sources! WE ARE ALL FITZROVIANS NOW!